What does the Bible say about Christian marriage? Should we get married now or wait? Are we really ready? When is the timing right? What if one of us is unsure? This mini-book, Considering Marriage, provides premarriage counseling that will help you on your journey of making the decision and preparations before you say, I do." Marriage is a beautiful covenant made between a man and a woman, so how do you know when it's right to get married? 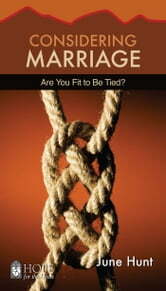 Includes Christian marriage counseling and premarital counseling questions, such as *Will his quirks drive you insane? Will her weird habits become a daily annoyance? Are you becoming more confident in your direction, or less? *Included in this easy-to-read marriage counseling handbook are dozens of exercises that are excellent tools for opening the door to meaningful communication. Learn what each partner's definition of love is, or their concept of the role and responsibilities of a wife and husband. These marriage quizzes will help you and your significant other maneuver through potentially tough and thought-provoking questions with ease. • Is it important to be romantically attracted to the person I want to marry? • When does age difference matter? 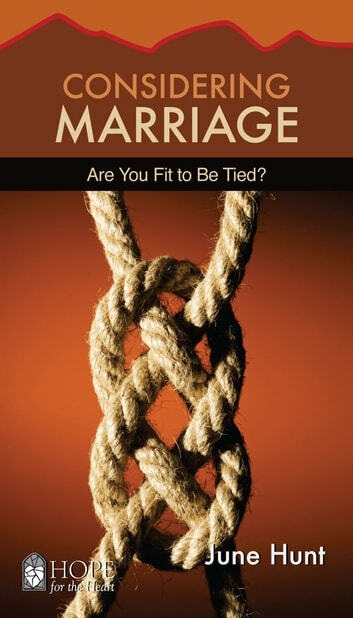 • What is the root causes for marrying the wrong person? • What if my non-Christian parents disapprove of my Christian fiancee? • Will God stop a marriage if it's not His will?